Early in the morning, Turkish troops advanced from the north towards the airport. A number of troops penetrated the perimeter wire of Camp UNIFCYP (which was the northernmost part of the airport complex) and were met by British soldiers. The approaching Turks were observed by the National Guard who fired (over the heads of Camp UNFICYP) at the advancing armour....which included at least one tank and an armoured personnel carrier. Through a mixture of German and French, RSM Birch (the camp's Regimental Sergean Major) told the Turkish Officer that everything in the area, with the exception of the teminal, was UN property. With some reluctance, the Turkish forces retreated to a small patch of trees some 50m away. Throughout the morning the defences of the airport were further reinforced. Additional troops included those who had so dramatically arrived the previous night. T-34 tanks, Marmon Herrington armoured cars, anti-tank and anti-aircraft guns were also added to the defences. It became clear to the UN that negotiations with more senior officers from both sides were required. With great difficulty and no little risk, a UN Officer eventually made contact with a Turkish General who appeared to be directing operations. Around 10:30am it became clear that an attack to capture the airport was in its final preparation and at 11am Turkish tank fire was heard. The Turkish forces advanced towards the airport on several fronts and came under fire from three directions and began to take heavy casualties. The dry scrub caught fire and blocked the approach of the attackers. A worse fate met the wounded who were burned to death before they could be helped. The attack quickly began to falter and the surviving troops halted or pulled back. With great tenacity the UN managed (after three attemps) to arrange a local ceasefire.......Greek fire would stop if the Turks would pull back. Earlier in the day, the National Guard Commander had approached the UN with a proposal. To avert a fight for the airport and cause a complete breakdown of the ceasefire agreed on the 22nd July, all Greek forces would be withdrawn from the airport and leave it under the control of the UN. Following high level contact with UN Headquarters in New York, the following announcement was made on local radio, in the press and passed to both combatants. "The United Nations Force in Cyprus is taking over the Nicosia International Airport temporarily after a new and serious breach of the ceasefire earlier this morning in the vicinity of the airport. The airport thus becomes a United Nations internationally protected area. This will at the same time facilitate the arrival of reinforcements for UNFICYP". 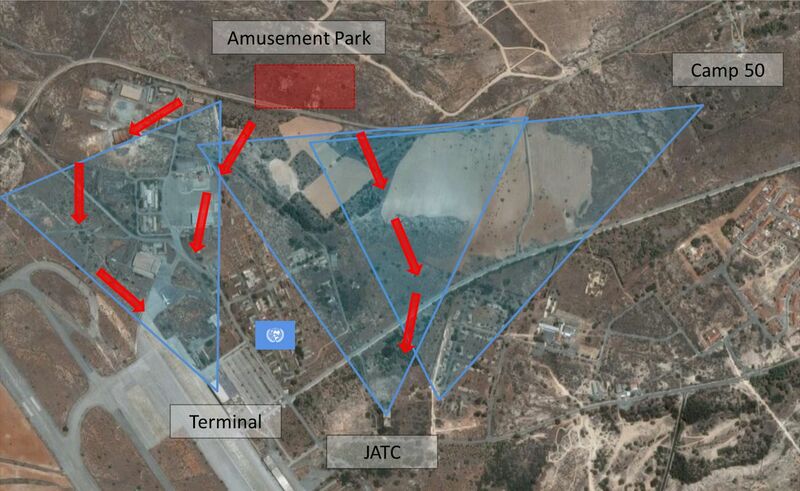 - the whole of the airport complex, including RAF Nicosia, Camp UNFICYP and the RAF quarters area lying within the perimeter wire fence, was to be regarded as a UN-protected area. - both sides must withdraw within one hour all troops to a point 500m beyond the perimeter wire and thereafter not approach within 500m of it. - UNFICYP would patrol the perimeter by scout car and on foot at regular intervals. - a UN officer would visit each side twice a day to see if either had any complaints or problems, and neither was to open fire before notifying these to the officer concerned. - UNFICYP would establish check-points on the Morphou road to prevent Greeks in civilian cars from driving past Turkish posts along the road. By 16:30hrs on the 23rd July the Greek forces had withdrawn from the airport and the size of the defending force was clear for all to see. Two tanks, eight armoured cars, three armoured personnel carriers, five 100m field guns, five vehicle mounted heavy quadruple machine guns, five Bofors anti-aircraft guns, five jeep mounted 105mm anti-tank guns, five trucks of ammunition and six bus loads of troops. This formidable force would have vigorously defended the airport resulting in a large loss of life and massive damage to the infrastructure. That evening, further obstacles were placed along the runways and a UN flag was flown from the terminal building. Due to a shortage of suitable armoured cars, airport fire trucks were used as patrol vehicles. A very eventful day finally came to an end.